Woman Tries to Put a U.S. Soldier in His Place. Here’s How That Worked Out. It’s amazing the freedoms some people take for granted these days.What’s even more amazing is who some of those people take their aggression out on – the soldiers. It’s fairly common for soldiers around the globe to hear the whispers told behind their backs, all because someone would rather see a uniform than a person. One soldier heard something one woman probably didn’t want him to hear, and his response is priceless! As a military vet who has served two tours in Afghanistan, and I’m still on active duty (though I’m now stationed locally in the US). 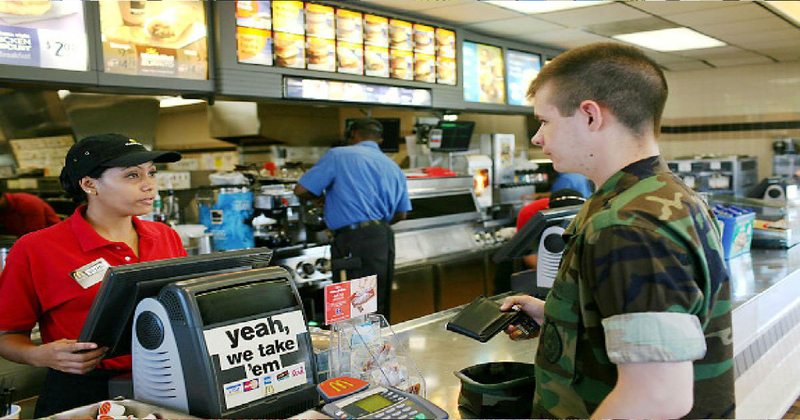 I don’t expect special treatment from civilians for my service, but I do know that many stores offer discounts to active military personnel so I usually ask cashiers if they offer the discount. Today, I encountered someone really rude when I asked – and it wasn’t the cashier. I had to say something. Me: Do you offer military discount? Cashier: No sir we don’t. Me: No ma’am. It’s a discount not a privilege. A privilege is being able to go home to your family every night because some people willingly give up their “privileges” so people like you can have them. Sorry if asking for a discount offended YOU. Man at the back of line: Here’s your military discount. Man’s Wife: You deserve it… for having to put up with [EXPLITIVE]’s like her.